An international gathering of people involved in peat and peatlands this week announced the awards for young peatland scientists, managers and practitioners in the early stages of their careers. Tadhg Ó Corcora, Conservation Officer with the Irish Peatland Conservation Council scooped an award for Ireland. 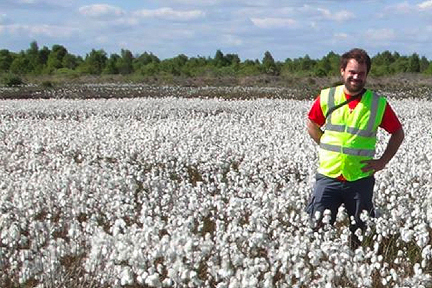 Tadhg is a native of Kildare and has a background in peatland management for conservation. He has been working with the IPCC for six years now in the Bog of Allen Nature Centre and is skilled in peatland restoration work. The awards are given by the International Peat Society under the Allan Robertson Grant Scheme. This is the inaugural year of the award which encourages excellence in the field of peatland management. The International Peat Society is a group whose memebrs have environmental and economic interests in peat and peatlands worldwide. They held their annual field meeting in Tullamore this week with the theme of Peatlands – A new Conversation. The grant is valued at €500 and can be used by the winner to further their work. ” I am delighted to receive this international endorsement for my work and I will be putting the funds towards a project to undertake Sphagnum moss restoration on Girley Bog in Co. Meath” says Mr Ó Corcora. “This site is an exceptionally good example of a raised bog which is a priority for conservation in Ireland and this award will allow me to further the on-going work of the IPCC on the Natural Heritage Area”, he added. As part of the meeting in Tullamore, Mr Ó Corcora presented a poster paper on his work entitled “Sphagnum moss cultivation as a means of restoring Irish raised bog habitat” which generated considerable interest from those attending. His attendance at the conference was supported by the Irish Environmental Network. This entry was posted in News and tagged Conservation, peatland restoration, sphagnum moss. Bookmark the permalink.